The end of winter is almost upon us, and while we finally get to ditch the shovels, snow removal is quickly replaced by other chores. If you’re like us and you love having a beautifully kept lawn, there’s a few tools you’re going to need. 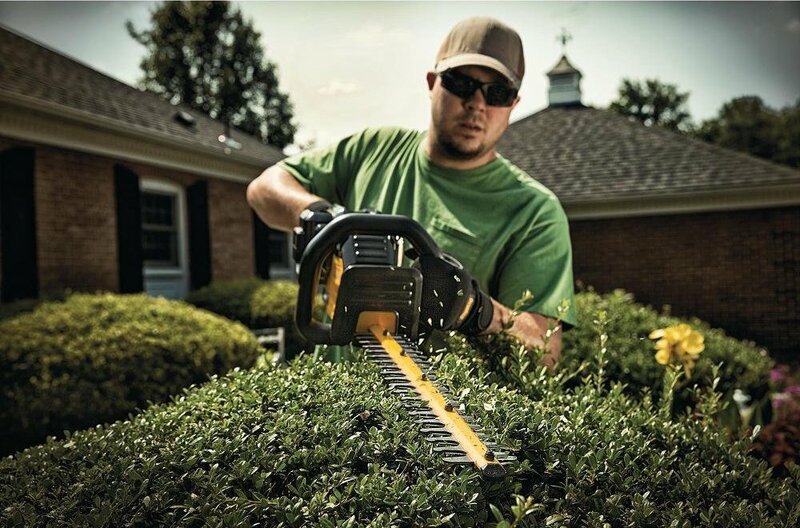 One of the most important tools for keeping your yard looking professionally cared for is a cordless hedge trimmer. Although wired and gas-powered versions of these tools are great, having a battery powered version is arguably much better. 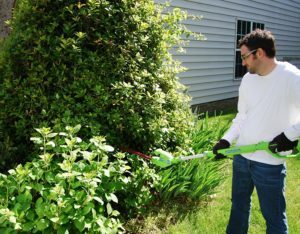 Most shrubs and bushes that need clipping are likely at the outer limits of your yard or garden, pushing your extension cords to their limits. Gas powered units are powerful, but bad for the environment, noisy and smelly. A battery powered unit will get the job done, giving you good shearing power but still with the flexibility to move around without a cord wrapping you up (or accidentally chopping it up). Follow these tips of what to look for when buying a cordless hedge trimmer and check out our curated lists of the best cordless hedge trimmers of 2017 to make sure your yard stays looking like this. 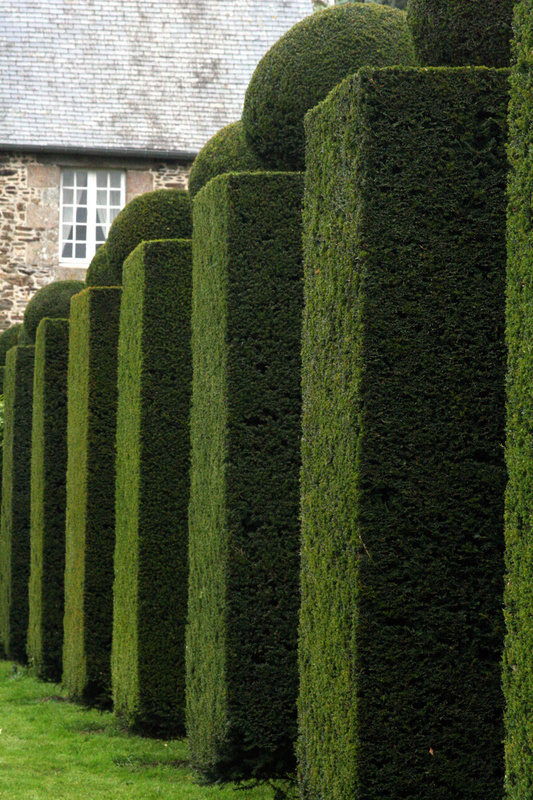 If you’ve never trimmed your own hedges before, take a look at these tips to help you out. Want to get right to it? This comparison table should help you make an informed decision. We reviewed countless different models and narrowed down the list to these three options. Want to get into every last detail of each one? Read on! How long do you need the battery to last? If you have an enormous yard with lots of trimming to be doing, then you’ll want to pick a model with a battery that lasts you a few hours. In general, the Ah (amp-hours) unit of a battery will tell you how long the battery will last, larger number meaning longer operating time. How thick of branches will you be cutting? In general, the greater the voltage of a battery, the greater the power output. If your hedges have many thick, stubborn branches, you’ll want to pick up a higher voltage battery. Another important thing to remember is that any trimmer will lose its effectiveness over time as the blades dull. As long as you keep your blades nice and sharp you shouldn’t have any problems. How tall are your hedges? 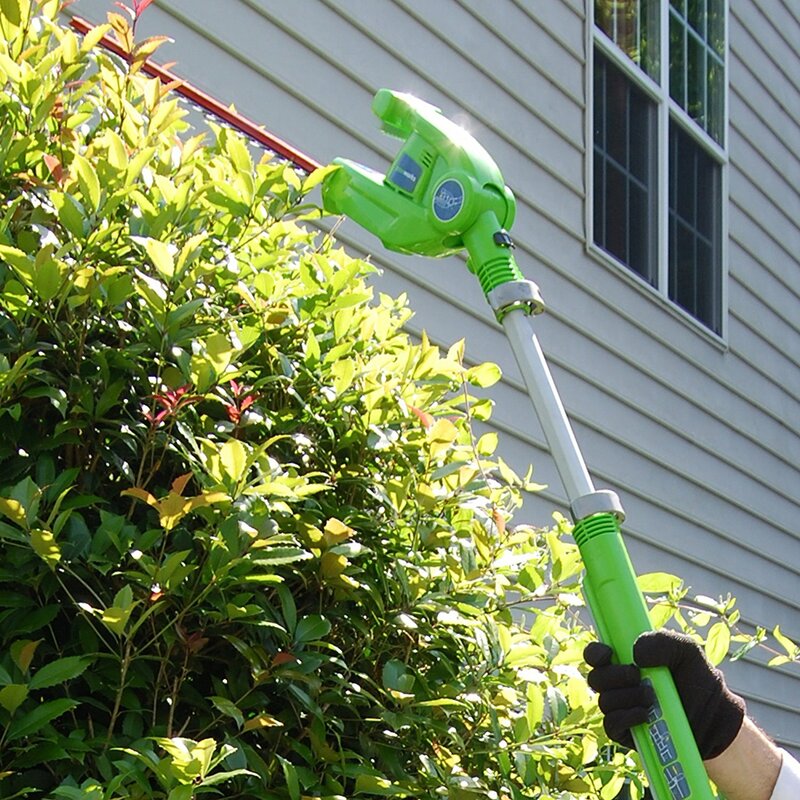 If you are going to be trimming up tall, hard to reach shrubs and bushes, it may be worth your while to invest in a pole-style battery powered clipper. These come with extendable poles to help you reach higher than a normal model. If you are going to be pawning off your yard care chores to your kids, you may want to consider a lighter clipper. Some of these cordless tools can weigh up to 12 pounds, while some hover around the 7 pound mark. If you are considering a more powerful unit, note that the larger tool with a larger battery will add some weight. M ake sure you will be able to get all the work done before tiring out! What brand of power tools do you own? If you already own some battery powered power tools like drills or saws, you can save money by buying the same brand of hedge trimmer. Check to see if the batteries are compatible and interchangeable (they often are). Not having to buy extra batteries will definitely save you some dough. Amazon carries tons of brands, so even if you don’t have a brand on our list, you can see if they have one that matches your existing tool arsenal. 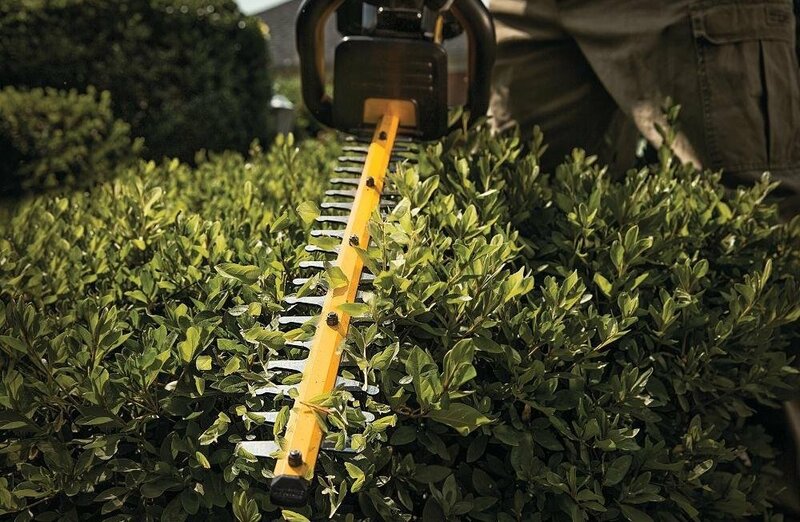 Now that you know what to look for, let’s dive into our cordless hedge trimmer reviews. We’ve curated a list of the best available, so you don’t have to spend hours researching every different aspect of each one yourself – we’ve already done it! Our pick for best overall, is the 20V Black and Decker Cordless hedge trimmer. This battery operated tool provides the best combination of all the most important features, and doesn’t come with a huge price tag. This 22-inch cordless tool is comfortable to hold and operate, with an ergonomic gripping handle as well as support handle for two-handed steady use. It’s lightweight, great for everyone in the house to be using at just 5.7 pounds (without the battery installed). The clear plastic guard protects your hands and face but allow you to still see what you’re cutting! The dual-action cutting blades are very effective, especially considering the affordability of this tool and its 20V battery. The blades are The 22-inch cutting arm is a nice middle ground – long enough to reach fairly high spots without adding too much weight. 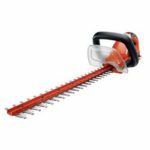 Black and Decker claims that it can cut branches up to .75 inches thick, and while that may be true, it’s not as effortless as we would like. It takes the tool a little bit longer to chew through these thicker branches so you may want to consider a more powerful tool if you are going to be regularly cutting branches this thick. The tool is powered by a 20V lithium ion Black and Decker hedge trimmer battery. While there are more powerful 40V batteries out there, 20V does the job for almost all situations while shearing shrubs. The battery last an impressively long while for such a powerful tool, around 40 minutes of use. Battery life is partly dependent on how hard you are pushing the tool however, and for light shrubs you could easily get longer life. 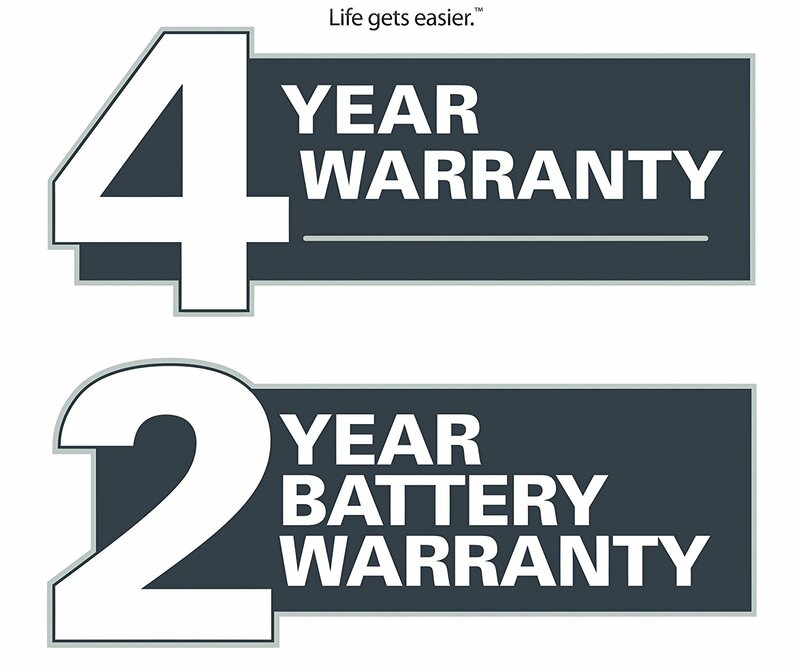 The lithium ion battery does not have a “memory” meaning that even a few years down the road you will get the same great performance. Depending on the size of your yard you may want to consider grabbing an extra battery. If the Black and Decker just won’t cut it (pun fully intended) for the type of job you’ve got, then this DeWalt clipper will have you covered. 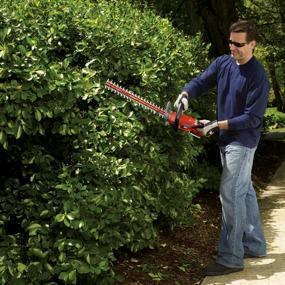 Although the Black and Decker is great for smaller jobs and the average shrub, thicker branches do give it som e issues. 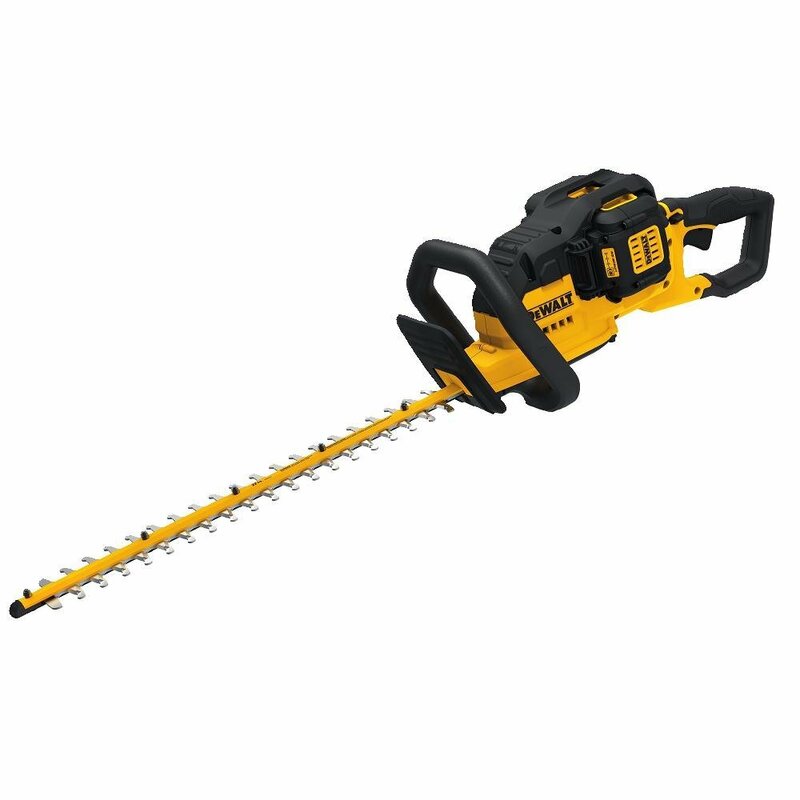 In that case, this 40V DeWalt battery powered hedge trimmer has you covered. This tool boasts impressive battery life and power and will have you shredding through shrubs like it’s your day job. 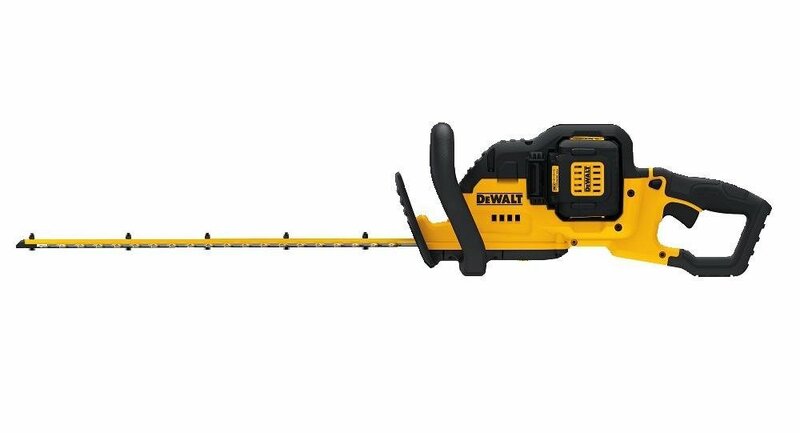 The DeWalt battery operated hedge trimmer boasts a massive 40V, 4.0Ah battery. While many folks dread moving from gas operated to battery powered units due to the lack of power, the DeWalt ensures that isn’t an issue. The motor absolutely hums when you pull the trigger, and the blades absolutely hum. The battery life is impressive, providing around 70 minutes on a full charge. This time will vary depending on the job, but you should get almost an hour every time. An LED indicates the charge state of the battery, letting you know approximately how much run time you have left – so you know if you need to hurry up and finish the job. There are two laser-cut serrated blades mounted on the arm, 22-inches long. This is good length for getting taller branches without adding too much weight to the unit. The gap between teeth of blades fits .75 inch branches, and it shreds them with ease. Branches of larger size don’t fit between the blades so they will require some more time in order to chew through. The blades are thick, quality steel and you should rarely or never need to sharpen them. 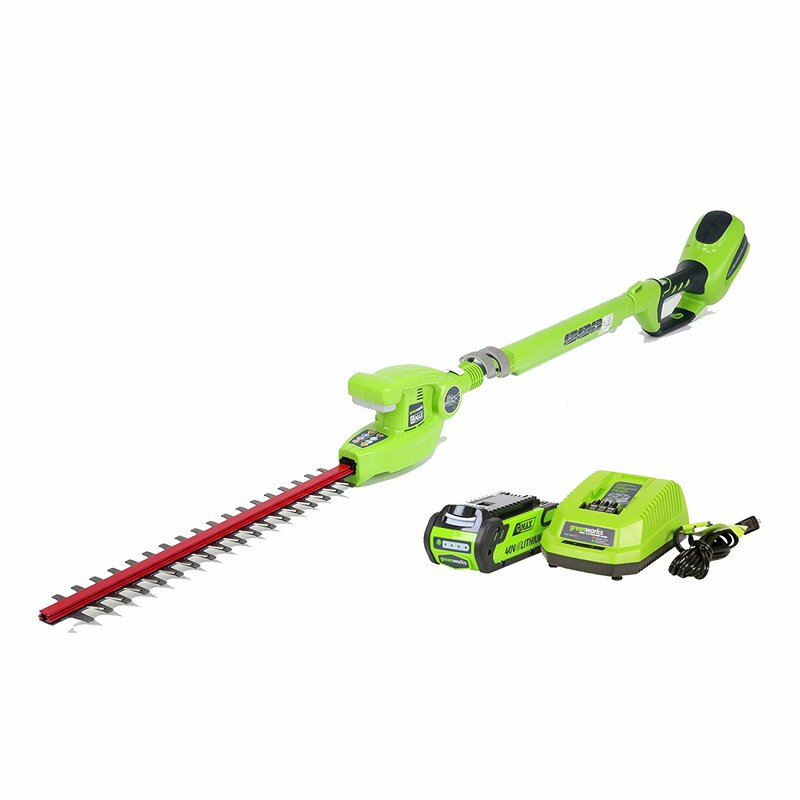 Due to the larger battery and engine, this battery powered hedge trimmer is a little on the heavy side. It’s around 14 pounds with the battery attached, so you may need to consider who will be operating it primarily and if they can handle it. Not that 14 pounds is really that heavy, but after an hour of trimming it can sure feel like it. This DeWalt tool is a heavy-duty machine giving you impressive cutting power, so you should expect it to be a bit heavier, although vibrations are surprisingly minimal. The last on our list is a cordless pole hedge trimmer. This tool is ideal for trimming those tall, hard to reach shrubs and bushes, without the use of a ladder. Our pick for the best available is the GreenWorks 22272. It’s lightweight, has a long-lasting battery and the pivoting head makes it ideal for controlled shaping and shearing. If you’ve got big, tall hedges you’ve got to keep in check, this is an awesome choice. While the other trimmers we put on the list have just more than a 20-inch reach of the blades, this GreenWorks machine provides an extra 2-3 feet of reach with the extendable adjusting pole. Adjusting the length of the pole is easy, just lifting the latches on the head and handle and then pulling the pole out to your desired length. The head of the tool, where the blade is attached, can also be adjusted and pivoted into three different positions, so you can cut at a comfortable angle, and get the exact shape you need. The two blades are 20-inches long, with 5/8 inch gaps between the cutting teeth. 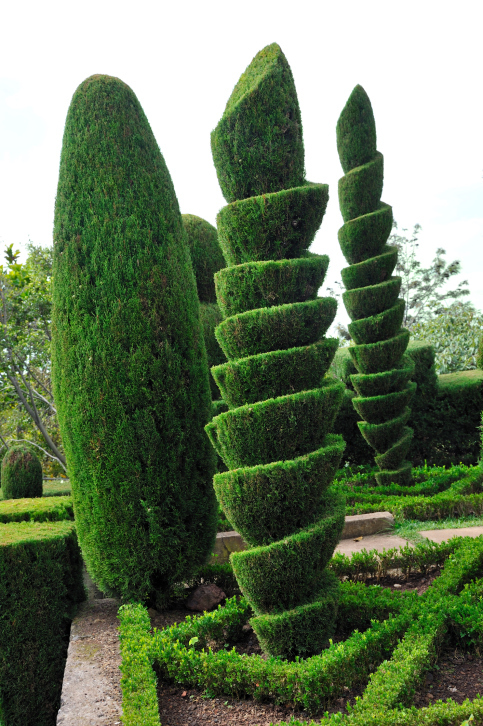 This makes the GreenWorks best for greenery with smaller branches. That being said, the motor whips the blades pretty quick and does pack a punch. Because this pole hedge trimmer is designed for use overhead, they’ve done a good job at giving the tool a lightweight design. It weighs just under 8 pounds without the battery installed. So regardless who is using it, you shouldn’t tire out too quickly. The battery of the GreenWorks isn’t quite as impressive as the other two models, providing around 30-35 minutes of operation. Depending on the job you can get up to 45-50 minutes though, if it’s a smaller, lighter job. Grabbing yourself a second battery is definitely recommended if you have a lot of hedges to work through. The batteries charge to full capacity fairly quickly, though. 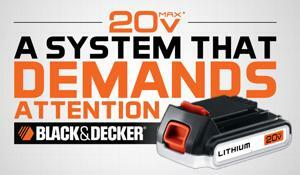 You also have options for a 2Ah or 4Ah hour G-MAX battery. Plus, if you have other GreenWorks G-MAX batteries, they’re all compatible and interchangeable. 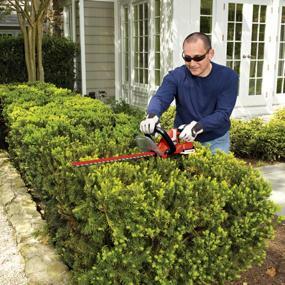 Did this article help you choose a cordless electric hedge trimmer? Do you own one of these already? Let us know your questions or comments below!